Mantle cell lymphoma (MCL) is an aggressive type of B-cell non-Hodgkin’s lymphoma that originates from small to medium sized lymphocytes located in the mantle zone of the lymph node. Extra nodal involvement is present in the majority of cases, with a peculiar tendency to invade the gastro-intestinal tract in the form of multiple lymphomatous polyposis. MCL can be accurately diagnosed with the use of the highly specific marker Cyclin D1. Few cases of mantle cell lymphoma presenting with intussuception have been reported. 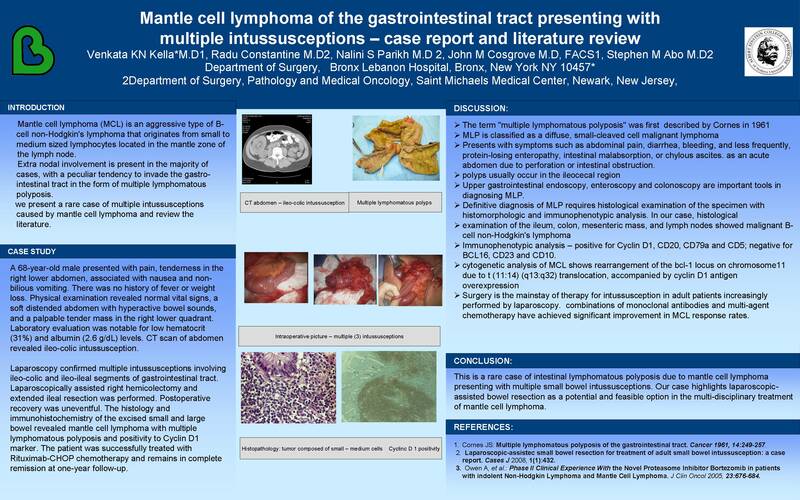 Here we present a rare case of multiple intussusceptions caused by mantle cell lymphoma and review the literature of this disease.